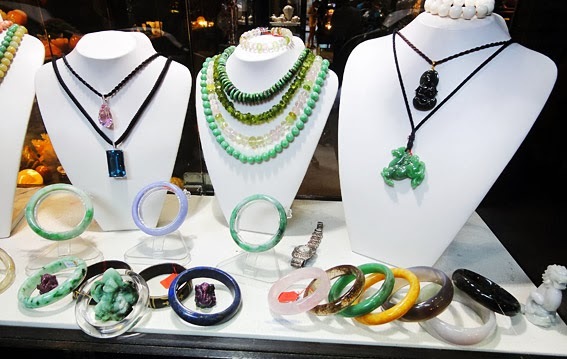 Most popular Chinese jade jewelry color is green & white and the type of artworks are mainly pendants necklaces bangles and statues such as a green bas-relief version of a jade Buddha image. Also in form of a mythical animals creation such as dragons and sometime just a simple birthstone carving there are also many variants with sterling silver. Among other jade studs earrings and finger-rings all made from rough natural jadeite-jade.Jade jewelry accessorize most rather cool clothing such as green and blue also somehow it blends better with blue and a setting with white gold silver and platinum. In the past jade jewelry has always been associated with the notion of China because all real jade was processed there including antique items that were often reworked to preserve the old character or simply created a fake. 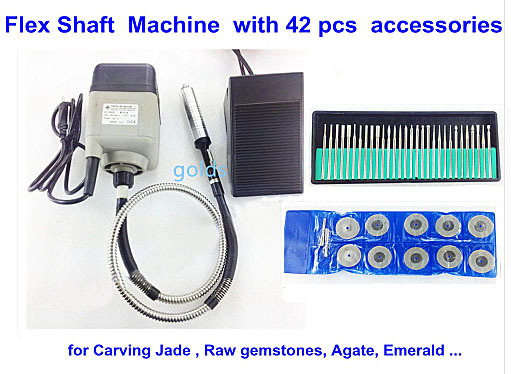 The picture show fine jade jewelry and a plethora of different colors and qualities including black which by the way gained in popularity after winning a certain "macho" image. But whatever color is selected the created item look always somehow pretty. Jadeite jade and nephrite (Yu) is a precious stone with an aura of superstition in particular with Chinese people often just beautiful finally it won’t matter. Just have a look on this jadeite rings earrings plus sterling silver and gold designs below actually new arrivals of are available almost every day in our website. Probably the most sought after jadeite jewelry are carved bangles plus bracelets and necklaces mostly made from raw jadeite-jade stone. There are several reasons for it one is probably the rich color spectrum which makes them fit any dress and the elegant appearance. Although the material is very tough almost like diamonds don't let them fall on a stone floor. White jade ring. When buying a high-end jade product consult a specialist since many crooks out there manipulate the pretty stone to make it look better and push the price higher. The result is that after about 3 years the once marvelous piece of jewelry deteriorates and value becomes zero. Imagine when you bought this for maybe two thousand dollars it won't be a good deal for a green jade bangle finally and a matching ring would be a good idea. Bangles and bracelets are often overlooked as jewelry. Bangles and bracelets are often hidden because they are covered by a blouse or other clothes which maybe make them the ideal summer jewelry to show what you have besides of the normal pieces people buy such as necklaces and rings. Outstanding body decoration which makes women shine are jewelry with some gold or silver mounted around the bangle to reflect the light back into the stone and have it shine this is jade and silver bangle bracelets. When buying a gorgeous bangle think about to add some silver cover to it or at least of parts to make it shine. Finally to have jade sparkle it needs some diamonds. As indicated get a bangle that fits you perfectly so that you feel comfortable. No matter what color Chinese people for various reason but mainly used for jewelry as ornaments for metaphysical and health purposes have always been highly desired and demanded by women. A jade stone and the piece of jewelry made from is just a fascinating crative thing of art and a pendant is for the front maybe hanging on a beautiful necklace of the same material metal or whatever. This is the birthstone for March / Virgo many other attributes are interpreted into such as protective ones and healing. There is no doubt jade it is a fine ornamental stone for a pendant with a purpose a green talisman. Here we have put a couple of affordable jade sculptured together you can easily purchase for a user friendly price range. Jade stone jewels and ornaments. Jade is attractive and mythical most creations have two things in common first its natural and second today many are made from Myanmar jadeite worked into sculptures and other pieces of art such as Buddha statues. Big small high and low-end and for $ 10,- all available but be vigilant otherwise they cheat you. This is a piece of precious stone where Chinese are masters to create beautiful objects out of it as jewels they are in fashion since at least since 6000 years as excavations of old tombs show. A exotic jade jewelry shop in KL. 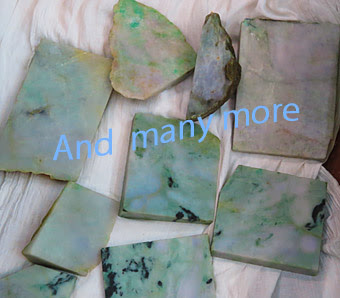 All jade colors and qualities from high to low end. Bangles bracelets and pendants are the most popular jade stone jewelry adornment in use. Since all colors and price ranges are available a wide spectrum for customers is available. 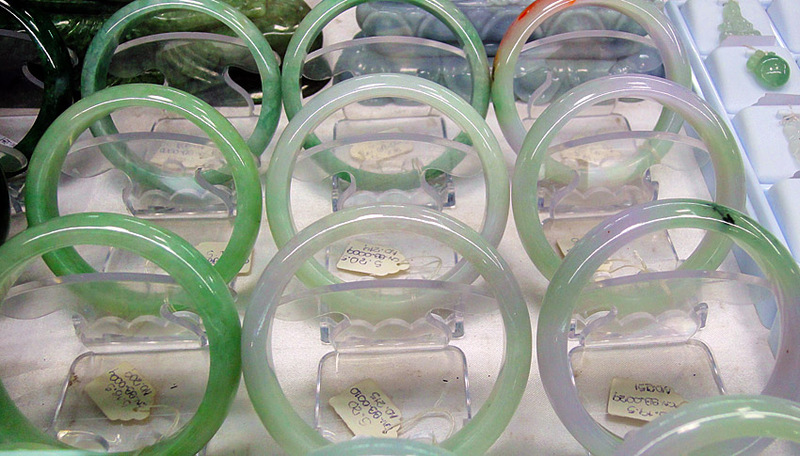 This are the second most popular items made from jade. Highly appreciated are green jades with carvings, They come in different sizes and prices, as usual, the most translucent saturated it is, the higher the price, here are Buddha Jade. Having them around the neck makes them highly visible and definitely a great body decoration they come in all colors and styles e.g.as a silver and green jade jewelry. There is also a superstitious element interpreted into the stone with Chinese people, to have a positive and protective effect for the person who wears it. 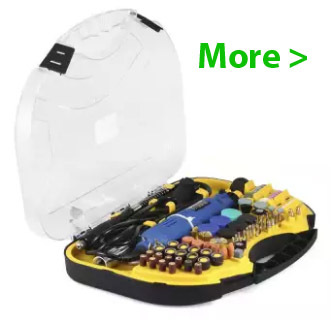 People think this ideas are also the same for small items. Rings are for sure sought after they need a good design and be polished with fine textures and no cracks set into white gold or maybe silver and platinum, looks great, often the stone has some carved motives. In general when buying it needs to be vigilant, if the piece of desire will be a more expensive item, lets say over around $ 1000,- take an expert with you, or insist to have the item checked in lab to determine the value since the seller will tell you anything you want to hear to finish the deal and once you bought its difficult to retreat so its better to be careful at the beginning. Jade necklace with diamonds this kind of jewelry fits every woman its simply and gorgeous and with present day styling its also fashionable. There is a wide spectrum available, maybe with a couple of diamonds around could be a real eye catcher but again they can get very quick very expensive. The technical methods to create a gorgeous piece out of a rather not valuable one are stunning and the buyer as an amateur is not capable of figuring out what's good and what not. You could also buy some pretty jewelry here on a confident level. Especially Chinese people are very creative in creating pretty things since many believe that if a person wears this and is involved in an accident the thing will be broken but its wearer will be protected. The famous jadeite version is popular for rings from Myanmar (Burma) and of nephrite (Chinese version) which could be Hetian Jade or other. But since their mines are slowly getting exhausted the Chinese import the raw jade stones from Canada (BC), Australia and other parts of the world and make small pieces of jewelry art out of it. The art is in a form of pretty carvings which is actually drilling. Just have a look at the pictures they are self explaining. We took some very pretty green and other pendants to show they are impressive and not costly although of good quality and workmanship there are many more just have a look. Be aware that many crooks manipulate the material to make junk look very good. But after a while, the “enhancements” disappears and your pretty piece is what it was just junk and nobody like that. These pretty little things are made from raw jade mined in north Myanmar as jadeite and elsewhere as nephrite. Be especially vigilant with white jade which is very often marble or a derivative of it to handle the fakes use this special UV fake detection lamp. For all variants available just browse our website and you will discover the “pretty thing” just you like and the very good news is here you find items which are high-end appearance and low-end price, that’s not a joke and come because Amazon has a real purchasing power to buy in bulk and achieve low prices which are passed to you the customer. Jade bangle prices start around $ 10.00 in Yangon and Mandalay markets but others costing several thousand are available too you might think why is that so? It is a bit like the pricing of diamonds the clearer they are the higher the price and that’s the same with jade. But it needs a real specialist you can trust to figure that out the normal shopper can’t see that with the naked eye although it makes sense to check the piece of jade with a 10-time magnifying glass to discover filled up cracks and other low-quality parameters. So we take your worries serious here you can buy and also feel good after many years. The jade color spectrum is really amazing considering that this is just a simple stone (mineral) which got some impurities included, usually trace elements in form of iron, titanium, tantalum and other, which made the color. Actually, that's the same with all minerals. Today skilled craftsmen make jewelry and statues out of it and not only that. 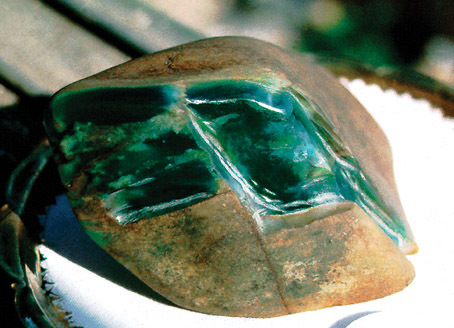 They also create gemstone "painting" where jade often is part of it. Jadeite bangle bracelets are not like chains no way to adjust the diameter afterward. So better thinks careful in the beginning if it fits your wrist especially when acquiring a high-end one. There are a few basic parameter one of them is if you are rather a bit bulkier person get a thick bracelet. For a harmonized appearance stay with one style, e.g. if one bracelet is round in shape, ensure all the others are round in shape either. Jade Buddha are the most common statues made from the gemstone. 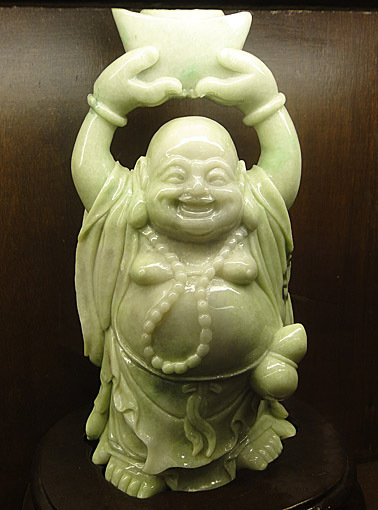 White Jade stands for purity, this is one of the reasons why most Buddha Statues are made from. 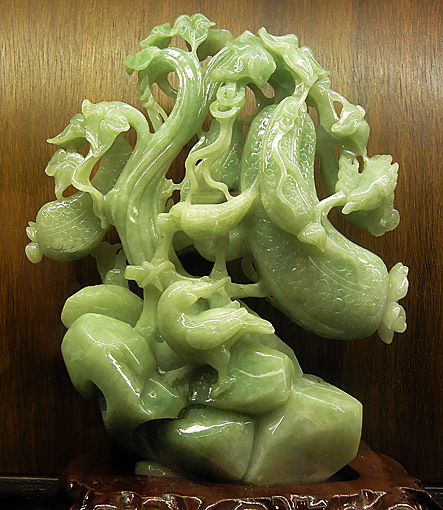 Good saturated and bright green jade colors are also called "Imperial Jade" and fetch the highest prices. That could be jade bangle bracelets which are the second most popular jewelry item made from the green stone. Carved Pendants are rather sophisticated pieces often with a sitting Buddha on top and jade Necklaces are the pretty things women like preferred is paired with diamonds rings are also very sought after either carved from a solid block or as a cabochon in a white gold or silver setting. Jade stones mean rocks boulders and pebbles from the river. This pieces of jadeite and nephrite are found from sizes of a few millimeters up to several meters. 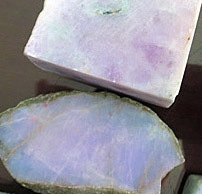 When they are extracted they look not much special but after the right treatment, cutting and an artist working on it can become a very valuable piece of gemstone, jewelry or decorative object. There are several mining areas in Kachin State one is around Hpakant which is already in the "insurgent war zone" and most business can only be done with the protection of the military which makes plenty of money with safeguarding boulder extraction. jade jewelry jade dresses jade rough jade-carving jade-jewelry jade-ornaments.